In previous articles, I have already looked at CPC, CTR, landing page and conversion success which goes to prove there are many different areas your PPC campaign can have success. Today, I’m looking at how you, as an advertiser, can achieve impression success in pay per click programs such as Google Adwords. In an article of mine, ‘Why PPC is the Preferred Method of Advertising‘, my first point in it is that PPC has the benefit of bringing you instant results (and when I say instant, I mean ‘within one hour’ results). The only way you can gain extreme instant results is through getting your advert displayed on as many websites running Google Adsense as possible. You want your advert to gain as much exposure to give your advert the best chance at getting clicked on. 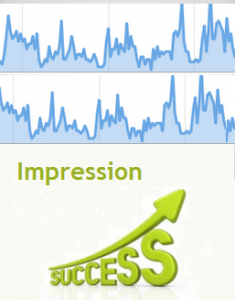 Therefore, impression success is when your advert gets the maximum amount of exposure providing you fast and instant results which is what many advertisers want in this day in age. The CPC you bid at. Different keywords will have different affects to your campaign. For example, some keywords have a higher CPC than others while others are extremely cheap to bid for. In other areas, some keywords will enable you to gain a lot of traffic compared to other keywords. The aim is to bid for keywords that have a huge audience. For example, you are always going to get more exposure with the keyword, ‘Car’ , than something such as, ‘Hot 3L Turbo Convertible Sports Car’. The audience for the first keyword is far greater than the second keyword which will increase your exposure of your advert. Pay per click advertising evolves around advertisers bidding for advertising placements on websites. Whoever bids the highest gains the spot on the website giving them maximum exposure. Therefore, if your not gaining many ad impressions, look at what your highest CPC is. You may find that you are constantly getting out bid causing other adverts to get exposure and not yours. For this reason, increase your CPC to a price where you feel you are gaining enough exposure and ad impression success. Some advertisers find that if they budget daily with their campaign, all their budget is spent in the morning and which causes their campaign to pause for the rest of the day to stop the campaign going over budget on a daily basis. Therefore, if you want instant and fast results, try to increase your budget so results flow consistently and constantly day by day. Otherwise, you will only gets bursts of results instead. If you are bidding in a market where competition is high, you will find that the demand for the market will be spread more fairly between advertisers reducing the exposure you could get. For example, the market for laptops has many different manufacturers which spreads the demand of the market to each manufacturer. Whereas, the market for micro-chips has two main manufacturers being Intel (around 75% market share) and AMD (around 25% market share). This means that the each company has more market share because there are less competitors. From this, aim for markets where the share of demand for advertising placements is not between many but only few. This will give your advert more chance of having increased exposure within the market if there are less to compete with for ad spots.